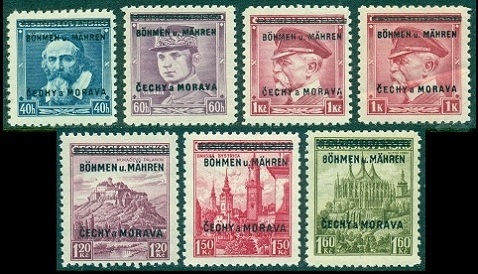 The Protectorate of Bohemia and Moravia (German - Protektorat Böhmen und Mähren, Czech - Protektorát Čechy a Morava) began to issue postage stamps in 1939, at the beginning of the German occupation. To make the notations of the catalog number listings locations a bit easier .... The Michel listings for Böhmen und Mähren will be found in their own section of the Deutschland-Spezial-Katalog. 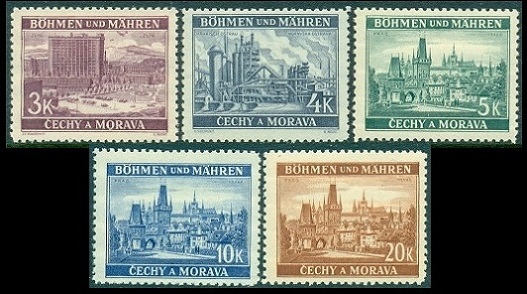 The Scott listings for Bohemia and Moravia will be found at the end of the Czechslovakia listings in the Scott Standard Postage Stamp Catalog. Due to the very sudden German occupation, the quick establishment of the Protectorate, and the establishment of the puppet Czech government in the Protectorate, there was no time to design and print a new series of postage stamps. 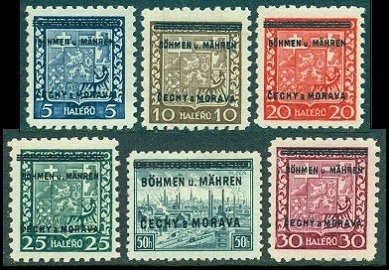 As a result, beginning in July 1939, the contemporary stamps of the former nation of Czechoslovakia were overprinted for use in the new Protectorate of Bohemia & Moravia. The new stamps are shown in the three images above (Mi. #1-19, Sc. #1-19). 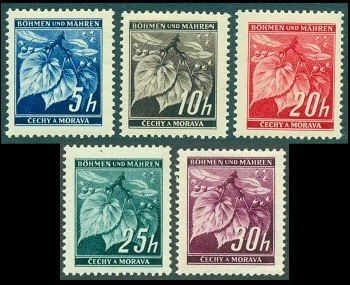 They are overprinted "Böhmen und Mähren" at the top and "Čechy a Morava" at the bottom. The stamps, a combination of coat of arms and landscape designs, are all beautifully engraved, and they have the same printing attributes as the original Czechoslovakian issues. The stamp designs in the first image depict the coat of arms of Czechoslovakia and a view of Pilsen. The stamp designs in the second image depict Jan Amos Komensky, General Milan Stefanik, Thomas Masaryk, Castle Pelanok near Mukacevo, Town of Banska Bystrica, and St. Barbara's Church in Kutna Hora. 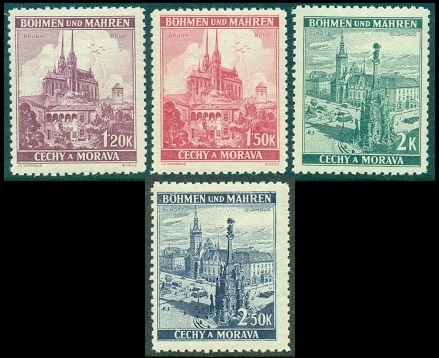 The stamp designs in the third image depict the Castle at Zvikov, Ruins of the Castle at Strecno, Castle at Cesky Raj, Statue of King George in Podebrad, Town Square at Olomouc, and Castle Ruins at Bratislava. 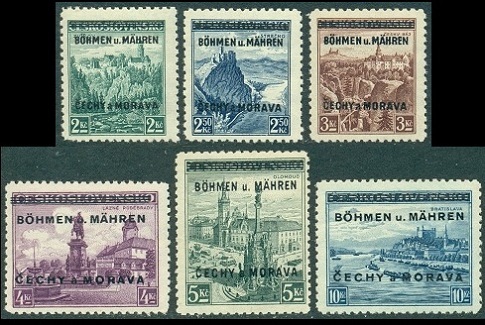 At the end of July 1939, the Protectorate of Bohemia and Moravia began issuing their own postage stamp designs. The new stamp issues are shown in the four images above (Mi. #20-37, Sc. #20-24, #27-39). The low value denominations in the first image were printed in photogravure and perforated 14. The higher denominations were engraved and perforated 12 1/2. The new designs in the first image depict linden leaves with closed buds. The designs in the second image depict the Castle at Zvikov, Karlstein Castle, St. Barbara's Church in Kutna Hora, and the Cathedral of Prague. The designs in the third image depict the Cathedral of Prague and the Town Square in Olomouc. The designs in the fourth image depict a view of Zlin, the Iron Works at Moravska Ostrava, and a view of Prague. In early 1940, a new linden leaf denomination and three new engraved designs were added to the 1939 definitive series (Mi. #38-41, Sc. #25, #40-42). They are shown above, and they have the same printing attributes as the 1939 definitive stamps. The new engraved designs depict Neuhaus, Pernstein Castle, and Pardubice Castle. In August 1939, a new set of Newspaper postage stamps, in nine denominations was issued, as shown in the images above (Mi. #42-51, Sc. #P1-10). The stamp designs all feature a carrier pigeon with the denomination at the right. The stamps were typographed and imperforate. The Michel catalog indicates that sheets of these stamps were privately perforated by various commercial firms. No other information is given. A collection of these privately perforated varieties, especially on cover, would be a great enhancement to any Bohemia and Moravia philatelic study. In December 1939, the 10 H. denomination was overprinted in black with "GD-OT", which stood for "Geschaftsdrucksache" - "Obchodni Tiskopis". These were issued for use by commercial firms. The triangle stamps shown above were issued in December 1939. The Michel Catalog refers to the blue stamp at the left as a Special Delivery stamp (Mi. #52, Sc. #EX1). The red triangle stamp at the right is referred to as a Postage Due Stamp (Mi. Portomarke #15, Sc. #EX2).